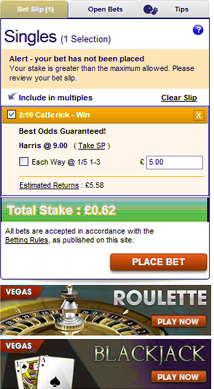 This ‘fun’ punter tried to place a bet of £5.00: Yes only £5.00 with one of the largest bookmakers in the world on a horse called “Harris” at odds of 9.00 (8-1 using fractional odds). This company would allow him to have a 62p bet at best odds guaranteed (this means if a horse’s odds drift after backing it you will get the bigger odds if it wins) (many bookmakers advertise that they offer best odds guaranteed everyday, but forget to mention that they withdraw this offer, if you win now and again). The reality is that a company making hundreds of millions of pounds per annum is not willing to offer a bet with a risk to them of £40.00, because this ‘fun’ punter had won a couple of hundred of pounds off them in the last 3-months. Yes a couple of hundred, not thousands. Whilst he was losing with them (October and most of November), this bet would not have been turned down. If he’d been a known regular loser he probably could have placed a bet of any size on this horse at the same price. And don’t forget to note the adverts for “Roulette” and “Blackjack” that appear every time you place a sports bet. Bookmakers love these games, as people cannot win in the medium to long term and it is possible to lose thousands of pounds 24-hours per day. Don’t forget this is ‘open and fair’ according to the regulators. What do you think?